Whether you need commercial or residential pest control, you can count on EcoFloridian to help, but we also offer lawn services and tree and shrub care. No matter who you are or what your needs might be, our mission is to make your lawn look great and to keep pests away from you and your family. If you have any questions or are ready to get started, contact us right away. When we walk you through each step of the process, you will know the type of service that you can expect. Our past clients are thrilled once they see what we could do for them, and we are confident that you will feel the same. If you are a resident of Pasco County, Florida, then you know how hot and humid the weather can be during the summer months. Many people enjoy the climate and friendly neighbors for which the area is known. Although the residents like this location, it’s not without its share of problems. Pests will promptly invade your home, property or place of business when you least expect them unless you take steps to prevent it from happening. If you would like to protect yourself so that you won’t need to worry about this problem, you are likely wondering where you can turn for answers. When you want to avoid pests and the issues associated with them, nothing can compare to the touch of a caring expert. No matter how hard you try to avoid pests, you can never eliminate the threat. If rodents, insects or other pests have overstayed their welcome and you want to take action to reclaim your property, we can get the job done right the first time. Once we arrive at your location, we will find and identify the pests that have been causing trouble, and we will then determine what approach will give you the best possible results. Since you can’t trust just anyone to protect you from pests, working with us will allow you to put your mind at ease, knowing that you are in good hands. As far as termites are concerned, they are a homeowner's worst nightmare. After these tiny creatures get the chance to invade a building, they will not waste much time when it comes to consuming wooden floors, walls, and support beams, resulting in structural damage. People will often overlook the threat until they no longer have enough time to respond, but you will want to avoid making that mistake. Buckling floors and walls are some of the warning signs that you can expect to notice, and you will want to take action without delay. Fleas, ticks, mosquitoes and other invaders will enter your yard and wait for the right time to make their move. Although protecting the inside of your home or office is a smart step in the right direction, it's not always enough. If you would like to enjoy unbeatable results, allow us to spray your lawn with a protective solution that will keep common pests away from your property. Hillsborough County, Florida, is home to Tampa Bay, which is one of the largest and fastest growing cities in the United States. With more people come more homes. And with more homes come more pest infestations. At EcoFloridian, our team of professional pest control specialists has more than a decade of experience helping homeowners prevent and eliminate every pest that resides in the Sunshine State. No matter the reason for your call, rest assured we handle it all. When you contact EcoFloridian for a pest control service in Hillsborough Country, our specialists will customize a treatment plan that meets the needs of your residential or commercial property. Our treatments are tailored to work as a partnership between our customers and our pest control professionals. Rest assured we use Integrated Pest Management methods to treat and control pests, which includes inspection, identification, and elimination. Protect your family and employees from the health effects that a pest infestation can cause. Avoid a hefty repair bill that a pest infestation can result in because of property damage. Safeguard the environment by entrusting a professional to apply an all-natural pest solution. Causing more than $30 billion in damage to man-made structures and crops in the United States every year, termites are without a doubt the most destructive pest in the country. In fact, homeowners in Florida spend an average of $3,000 to repair damage caused by a termite infestation. To protect your property and finances, it's vital that you contact EcoFloridian immediately if you notice that termites have infested your home or business. If you don't take care of it properly, your lawn can quickly become a safe haven for weeds and pests. And once pests invade your yard, the next place they will look to infest will be your home. In addition to our indoor pest control services, EcoFloridian also performs a number of lawn maintenance tasks, which includes lawn spraying. Stop pests from invading your lawn and entering your home. Avoid complaints and fines if you reside in a neighborhood that has a homeowner association. Enhance your home's curb appeal and increase its resale value. For more information about our high-quality pest control services, contact EcoFloridian at (888) 774-2998. Pinellas County, FL part of the Tampa-St. Petersburg-Clearwater metropolitan area fronts the Gulf of Mexico on the west and Tampa Bay on its southern and eastern sides. It includes barrier islands, miles of beaches and a number of parks and protected areas that contribute to the county's natural beauty and popularity. However, the warm, humid summers and moderate winters are not only attractive to humans. The area is also home to diverse wildlife. Although wildlife and insects play an important role in the ecosystem, they become nuisances when they invade our living spaces. Some insects and wildlife are merely bothersome. Others are destructive and carry diseases. If you find unwanted critters sharing your home or business, the safest, most effective way to get rid of them is to call a professional pest control service that uses integrated pest management techniques. This ensures that environmentally friendly methods are used to minimize danger to you, your loved ones and the ecosystem of your region. Termites, ants, cockroaches, and bees are a few common insects in Pinellas County that may be eager to take up residence in your home. The county is also home to opossum, gophers, rats, bats, and raccoons. Many carry diseases and parasites. Rats and raccoons are troublesome because they have adapted to the urban environment. They are not choosy about where they nest and eat a variety of foods that are accessible around homes. EcoFloridian Lawn & Pest Control has experience in identifying breeding grounds and food sources that these unwanted critters require. We use IPM techniques to expel these pests from your home by removing sources of food, eliminating breeding grounds and using the least harmful chemical applications when required. The appearance and comfort of your commercial establishment affect the way both clients and employees regard your products and services. In addition, some pests pose health hazards. Many pests, including ants, cockroaches, termites, and rodents, seek out moist places to breed and nest. Check under sinks and behind tiles in kitchens and bathrooms for leaks. Repair leaking plumbing to keep moisture from accumulating. If you have pests in your commercial establishment, call a pest eradication professional to evaluate the problem and remove them. EcoFloridian Lawn & Pest Control works closely with business owners to identify the pests causing the problem and devise effective treatment plans. To prevent re-infestation, regular treatment may be needed. There are several types of termites that thrive in Florida. Among the most destructive are subterranean termites that nest underground and burrow through mud tube tunnels to sources of food. Termites eat wood, cellulose materials, and plastics. Tell-tale signs of termite activity include sawdust or insect wings near wooden objects or around doors and windows, blistering wood or mud tubes on walls or flooring. If you think you have termites, it is important to act quickly. Termites can cause extensive damage before you know they are there. Treatment plans are devised depending on the type of termite present. 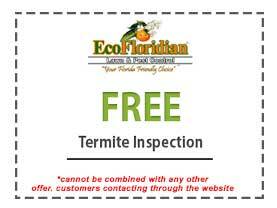 EcoFloridian Lawn & Pest Control has years of experience in treating termite infestations in Pinellas County. It is important to treat pest infestations quickly so that pests don't take over your home or commercial establishment. We provide individualized pest management strategies that minimize harm to you and the environment while eradicating the problem. 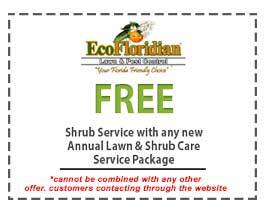 For a free estimate, call EcoFloridian Lawn & Pest Control at 888-774-2998. Hernando County's mild winters make the area popular for vacationers and seasonal residents. The summers are hotter and humid. With a plentiful water supply, gardens, flowers, and trees survive easily. The vegetation creates a good environment for insects, the insects attract prey and the food of residential areas attracts pests that feed on those predators. Also, many pests are attracted to humans and animals. At EcoFloridian, we offer eco-friendly pest control solutions. From mice to silverfish, there are many nuisances on local properties. Spiders come into your home when other insects such as ants or cockroaches enter the house looking for food. Cockroaches, ants, and mice contaminate your food. Rodents can carry listeria, hantavirus and other harmful illnesses and transmit it through their urine or feces. Mosquitoes, ticks, and bedbugs feed on your blood, and both mosquitoes and ticks may carry long-lasting harmful diseases. Beetles and silverfish destroy papers, clothing, and bedding. Argentine ants can destroy your landscaping by killing the helpful ants that otherwise keep harmful insects under control. Bees, wasps, and fire ants have painful stings that may cause life-threatening allergic reactions. Any type of pest problem warrants professional solutions for your safety, comfort, and peace of mind. Termites destroy anything from foundation beams to trees on your property. You may suspect an infestation when you start seeing piles of shed wings, dirt tubes along the foundation or hollowed-out wood. These pests multiply fast and build massive colonies. You may have multiple infestations on your property. Since termites can destroy an entire garage or foundation in a short amount of time, you must call for professional termite removal at the first sight of a problem. We encourage people to call us even if they suspect an infestation but have not confirmed it. This is because infestations can be hard to detect when they are under foundations or behind walls. We also suggest affordable regular preventative treatments to avoid costly future infestations. While some insects may harm your lawn, another type of pest that is not a bug is a weed. There are many different types of weeds that grow quickly and suffocate your plants or grass. This leads to dead or dry patches on your lawn, and it may be expensive to replace some of your plants. You may lose some of your garden crops if weeds take over. We offer lawn spraying to treat problematic weeds. The spray kills existing weeds and prevents them from returning. Fungus growth is also a problem in this area, and our spray also targets this problem. Having a healthy lawn is a source of pride for many residents, and it may be a requirement by several local HOAs. If you want to prevent the costliest pests from invading your home and want to maintain a beautiful green lawn, please contact EcoFloridian. We have been building a reputation for quality service since 2010. Our treatments are innovative and offer great solutions for protecting the environment while still effectively removing pest problems. For answers to any questions or for a free quote, please call us today. Termites and other pests like Citrus County for all the same reasons that its residents do: the warm Florida sun, regular rainfall, fertile soil and beautiful trees. At best, insects and wild animals are a nuisance. At worst, they pose health risks to people and pets or cause significant property damage. Getting rid of them is a job for the experts. Some of our most common home invaders are mosquitoes, ants, flies, roaches and palmetto bugs. Unfortunately, no one treatment is effective for all of them. Many homeowners who attempt do-it-yourself pest control waste a lot of money on the wrong products and, in the end, have to call a professional anyway. Our technicians know bugs and animals. They have the knowledge, training, and experience to correctly identify all kinds of creatures. They can tell you why rodents or snakes are attracted to your property. They can find critters' hiding places. They’re educated in life cycles, behaviors, and breeding habits. They can even tell you that ghost ants crave sweets or that mosquitoes can lay hundreds of eggs in just a teaspoon-size body of water. Protecting your family and your investment is an ongoing process. We can help. Termites multiply rapidly. If a colony is not discovered early on, its population will explode. Significant damage can occur before anyone notices. Subterranean termites build an elaborate system of tunnels in your yard and travel through them to aboveground wood sources. If you have mulch or a stack of firewood right next to your house, you may as well roll out a red carpet. It’s cellulose that termites are after, and any material derived from plants or plant byproducts contains it. Wood, paper, books, fabric, sheetrock, insulation, and carpet are just a few examples. Around 600,000 U.S. homes are invaded by termites each year. You’re taking a big risk if you think it won’t happen to you. Weeds are the least of your worries. The spread of plant diseases caused by fungi results in brown, withered grass and vegetation. Your grass and shrubbery are an invitation to dine for insects who live above the ground. Underneath the soil, grub worms and other pests attack stems and roots, and their presence invites unwelcome wildlife. Skunks, moles, raccoons and other varmints are crazy about them. They rip up grass or dig tunnels in yards looking for their favorite snacks. Weeds, diseases, pests and wild animals interfere with your lawn’s nutritional support system to prevent healthy growth. We can diagnose what’s ailing your yard and prescribe the best treatment. It will get just the right dosage of nutrients and fertilizers. Our sprays comprise natural plant oils that pose no threat to humans or pets. With regular maintenance, your property will be a contender for Yard of the Month in no time. EcoFloridian Lawn & Pest Control is committed to making homes and yards safe and enjoyable. We do thorough property inspections and pinpoint conditions that attract pests. We find their breeding grounds and effectively treat them. We offer affordable quarterly or yearly plans to prevent critters from returning. Be proactive against the pests that threaten your family and property. Call us today for a free estimate.